For the first time since Saddam Hussein invaded Kuwait in 1990, Saudi Arabia could face the ultimate petroleum test: pushing its complex network of oilfields, processing plants, pipelines, tank farms and export terminals to the limit, pumping every possible barrel of oil. Today another Middle East crisis is stretching the Saudi oil machine. U.S. sanctions on Iran are crippling exports from the Islamic Republic, prompting buyers to look to the world’s largest exporter for replacement barrels. In a pithy description of its role during a supply crisis, Majid Al-Moneef, a former Saudi senior oil official, told U.S. lawmakers a few years back that “Saudi Arabia is the ‘Federal Reserve of oil,’” according to American intelligence cables published by Wikileaks. 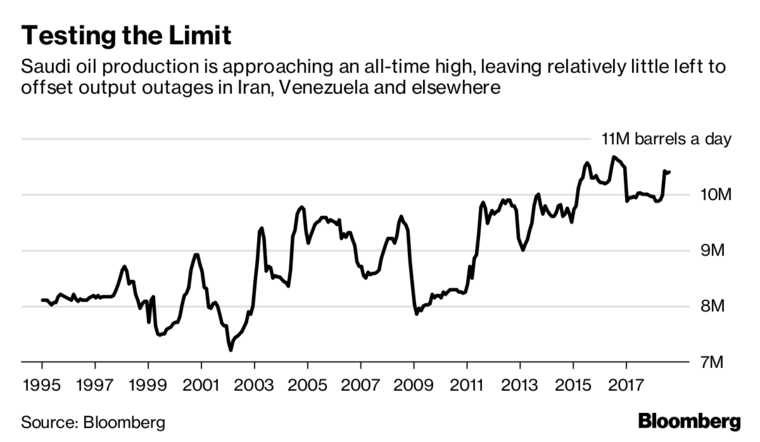 “Any unforeseen outages such as those from Libya, Venezuela or elsewhere could potentially expose the lack of OPEC’s spare capacity — particularly of Saudi Arabia,” said Abhishek Deshpande, an oil analyst at JPMorgan Chase & Co. The United Arab Emirates’s energy minister, Suhail Al-Mazrouei, told reporters last week the cartel had to be cautious and not “overuse” its limited buffer. OPEC’s current spare capacity is relatively thin. 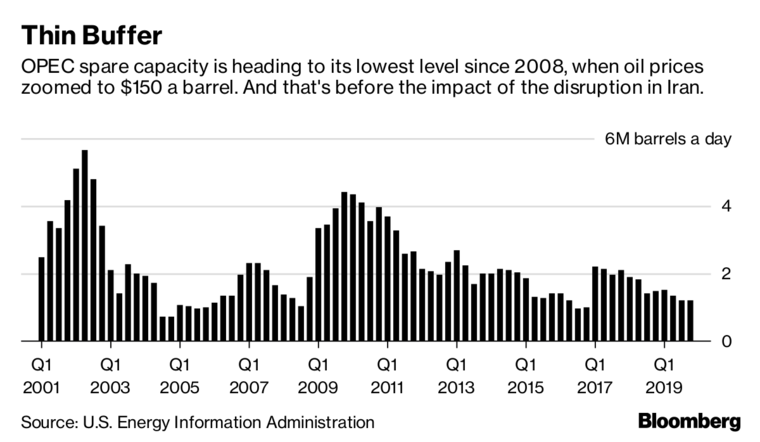 The U.S. Energy Information Administration, puts it at just 1.4 million barrels a day, and estimates that it will drop to 1.2 million by late 2019, one of the lowest levels on record and similar to 2008 when oil prices zoomed to $150 a barrel. Nonetheless, Riyadh says there’s lots of extra oil at hand. Energy Minister Khalid Al-Falih last week said more barrels can flow “within days and weeks.” Officially, the kingdom claims to be able to pump at a maximum of 12.5 million barrels a day, up from a near-record 10.4 million produced in August — spare capacity of more than 2 million barrels. Before the sanctions were announced in May, Iran was exporting between 2.5 million and 2.8 million barrels a day. By the time the sanctions take effect in November sales may drop to just 1 million barrels, far lower than anticipated. On paper, the Saudis should be able to fill the 1.5 million to 1.8 million gap — but only just. “The market is discovering that margins are not so high,” Patrick Pouyanne, the head of French oil giant Total SA, said in an interview. The energy industry is increasingly worried. The angst was evident at the annual Asia Pacific Petroleum Conference — one of the biggest annual gatherings of the oil-trading industry — this week in Singapore. In client meetings, conferences and the round of evening cocktail parties, executives were privately doubtful the Saudis can quickly lift output beyond 11 million to 11.5 million barrels a day — not enough to replace Iran. “Near-term spare capacity is effectively maxed out,” Amrita Sen of consultant Energy Aspects Ltd. said, echoing a widely held view across the industry. “I believe we can easily get up to 11.4, 11.8, almost immediately in a few day,” Naimi told CNN in 2012. “All we need is to turn valves,” he added. The other 700,000 barrels a day to reach about 12.5 million requires three months of work, however. “And the 90 days is for one thing: to mobilize additional drilling,” he said. There’s one more complication: of the 12.5 million barrels a day, only 12 million is controlled directly by state-owned company Saudi Arabian Oil Co., or Aramco. The other 500,000 barrels a day lies in the so-called Neutral Zone shared with Kuwait. But the region hasn’t produced a single barrel for nearly two years due to a dispute between Kuwait and Riyadh. Al-Falih said last week that “as the supply shortfalls were a concern” for customers, “we did make a determined effort to top up the storage that was not already full.” As well as domestic storage, Saudi Arabia has filled up its strategic storage in Okinawa, Japan; Sidi Kerir in the Mediterranean coast of Egypt; and in the European oil hub of Rotterdam. Officially, Saudi Arabia declared stocks of 229 million barrels in July, the latest data available, down from a record high of 329 million in October. Yet again, as with the spare capacity data, the market also has its doubts. Antoine Halff, an executive at Kayrros, a company that uses satellite data to track storage, takes issue with the Saudi numbers.